In the near future, off-grid communities of up to 20,000 population might be powered by a nuclear reactor the size of a container that is swapped out every 20 years. Existing plants emit no emissions but overall are just too risky for some. There's also competition now with low natural gas prices and wind and solar projects, which has allowed the small reactors to emerge. The Tennessee Valley Authority has become the first utility to apply for a permit from the Nuclear Regulatory Commission to build a small reactor. Others are following suit, there is a plan by the Utah Associated Municipal Power Systems to build one about 100 miles southwest of Yellowstone National Park; it is said to produce electricity like no other. Small nuclear reactors may be a safer and a cheaper alternative to nuclear power plants. They can be manufactured in a factory and hooked-up on-site, potentially avoiding the huge upfront capital costs and the overruns that have plagued many nuclear plants. They are theoretically safer, reducing the need for huge containment vessels and other expensive protections. Unlike other nuclear reactors that usually produce about 1,000 megawatts of carbon-free electricity, the small modular reactors, are designed to be a fraction of the size at 50 to 300 megawatts. Rather than using electrically operated pumps and motors to circulate coolant and keep the core of the nuclear reactor at a low temperature, as happens in traditional plants, small reactors use no pumps and motors and instead rely on passive means such as gravity and conduction ­­to cool the reactors. The size also means that it is cheaper to produce, as opposed to the $10bn and up to a decade in planning to secure permits and build of conventional nuclear. The group wants to replace their old coal-fired plants and it won the approval from the US Department of Energy earlier this year to analyze the environmental and safety impacts of the small nuclear reactor. If it passes the test, the consortium plans to build a power plant there with 12 reactors totaling 600 megawatts in capacity. Gene Grecheck, a former president and the current co-chair of a policy advisory committee at the American Nuclear Society, which represents engineers and scientists. Grecheck says that scientists are studying other ways to improve nuclear technology. 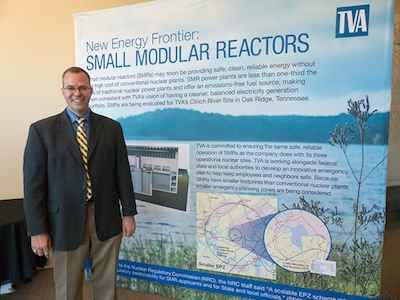 "There is also a lot of research going on for advanced reactor concepts to take used fuel and reprocess it to reduce [the spent fuel] even more dramatically," he said. Startup companies are working on using spent uranium fuel include the Bill Gates-backed TerraPoweras well as Transatomic and Terrestrial Energy. Another start-up, Oklo, seeks to create 2-megawatt reactors that fit inside shipping containers to provide electricity for remote off-grid locations. Toshiba has worked on a micro nuclear reactor that is designed to power individual apartment buildings or city blocks. The new reactor, which is only 20 feet by 6 feet, could change everything for small remote communities, small businesses or even a group of neighbours who are fed up with the power companies and want more control over their energy needs. A new report by the U.K.'s government-backed Energy Technologies Institute outlines what it considers to be a reasonable timeline for the country to also adopt the new smaller reactors. It has been estimated that they could be in use by 2030. For that to happen, talks between operators, developers, and the government would have to begin next year. But fears about the safety of nuclear plants have made them so costly as to discourage investors. "Creating the right environment for increasing investor confidence is critical if this schedule is to be met," says Mike Middleton, the author of the report. There are already small modular reactors operating in Pakistan, India, Serbia & China. Russia is in the process of converting two small reactors which used to power icebreakers. They will eventually be placed on barges which can then be moved to where they are needed. America are next in line. Even if it does happen in the U.K. they will still lag behind America. If all goes as planned, the facility in Tennessee could be up and running by the mid-2020s.